The city of Linz is situated along the banks of the Danube River. This drawing from 1850 views the cityscape from the town Urfahr, across the Danube. “Linz Donaulände, Zeichnung” (Signatur: Oberösterreichisches Landesarchiv, Allgemeine Fotosammlung, foto04249). The popular narrative that outbreaks of cholera, or, to a lesser extent, even the fear of an approaching epidemic led to sanitary reform in European cities in the nineteenth century has been challenged in more recent research literature. Direct connections between the occurrence of the disease and the implementation of sanitary measures are seldom found. Thus, its effect on sanitary reform has often been overemphasized. 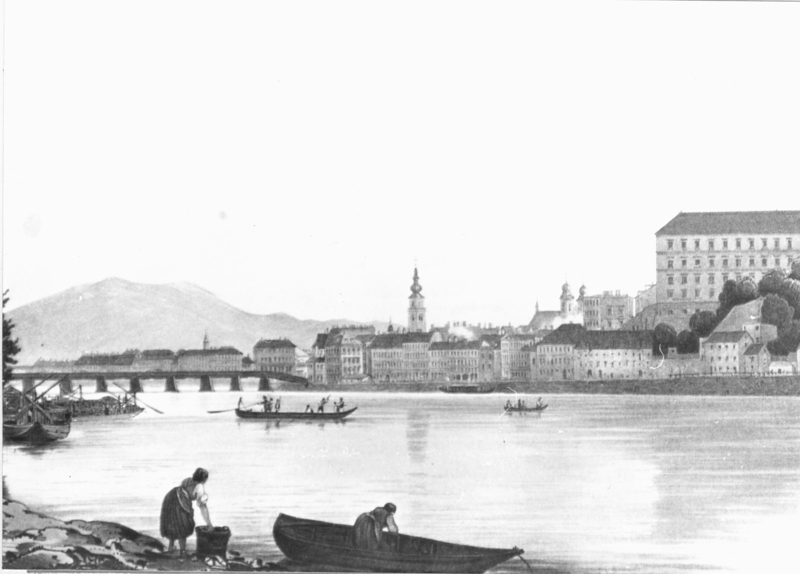 The case of Linz, a mid-sized city (31,000 inhabitants in 1869) situated along the river banks of the Danube in Upper Austria, contributes to this revised interpretation. Focusing on the most essential part of city sanitation—the introduction of a systematic network of water supply and sewage disposal—it becomes obvious that the reasons and motives for implementing this cannot be reduced to the outbreak of epidemics or the perception of diseases. During the early cholera waves, quarantine and attention to personal hygiene and diet were suggested as prevention measures, as was the disinfection of houses and clothes. 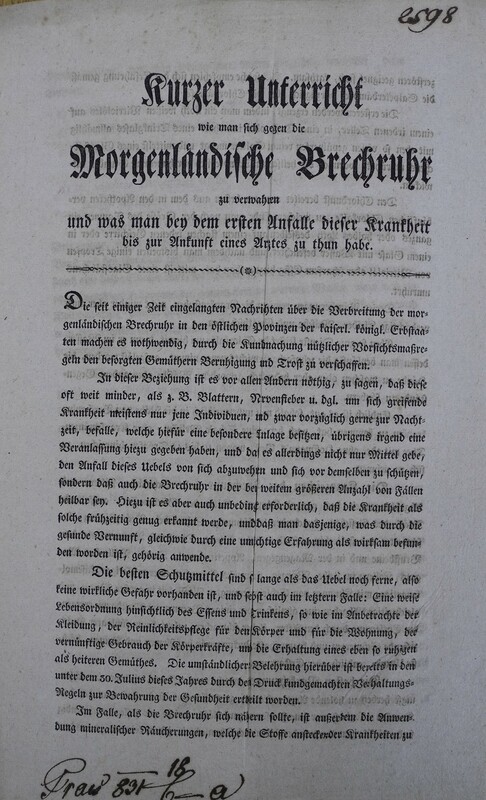 (Image: title page of an instructional text on cholera prevention, “Kurzer Unterricht, wie man sich gegen die Morgenländische Brechruhr zu verwahren, und was man bey dem ersten Anfalle dieser Krankheit bis zur Ankunft eines Arztes zu thun habe,” Linz 1831). “Kurzer Unterricht wie man sich gegen die Morgenländische Brechruhr zu verwahren habe” (Signatur: Oberösterreichisches Landesarchiv, Landesregierungsarchiv Präsidium, Sch. 149). Linz was only minorly hit by the early cholera wave of 1831. But in the year 1855 more than 900 people fell ill and about 430 died in a major outbreak. In spite of the disease’s impact, discussion about the implementation of a modern water infrastructure only set in more than ten years later. In a session in 1868, the city council generally acknowledged a connection between poor drinking water and both cholera and typhoid fever, with reference to findings in other cities. 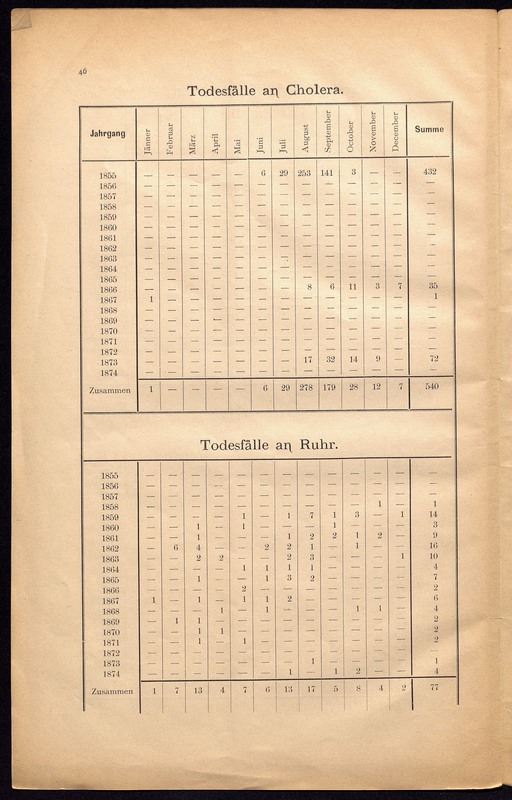 No connection was made to a recent cholera outbreak in Linz in 1866 with 36 casualties, nor were the 20 to 30 victims (per year) of endemic typhoid fever mentioned in this context. Centralized sanitary measures were, nevertheless, discussed for the first time. Following a report by the external engineer Rudolf Linner from Graz, the city council considered infiltrated soil to be responsible for the contamination of well water. The transmission paths of the diseases were not yet known, but were rather controversially discussed among scientists; Linner followed the German hygienist Max von Pettenkofer, who thought miasmas rising from the soil were a vector of cholera. As a solution, the city council suggested erecting a proper sewage disposal system “in the interest of the residents’ health.” As in other cities, the council had principally noticed the necessity of city sanitation for public health. Yet it seems that the actual (minor) impacts of cholera and typhoid fever had not contributed to these considerations in Linz, nor had they made the implementation of sanitary measures happen sooner: a definite project was not drafted at the time of outbreaks. In 1873, a new cholera wave swept over Europe. Even then, the fear of the approaching epidemic and the outbreak itself, which claimed 72 lives in Linz (i.e., 4 per cent of all casualties), did not accelerate sanitary reform. The city council rather focused on established responsive measures: calming the residents and disinfecting cesspools and toilets. Throughout the cholera wave the modern sewage system remained a mere idea. Construction eventually started in 1876. The building of a water pipeline had been entirely outsourced to a private company at the beginning of the 1870s. When the project failed in the very year of the cholera outbreak, no alternative was available. Two more attempts at private water supply projects in that decade were unsuccessful. “Die Sanitätsverhältnisse der Landeshauptstadt Linz und der eventuelle Einfluss einer Wasserleitung auf dieselben” (Signatur: Oberösterreichische Landesbibliothek, II-283). 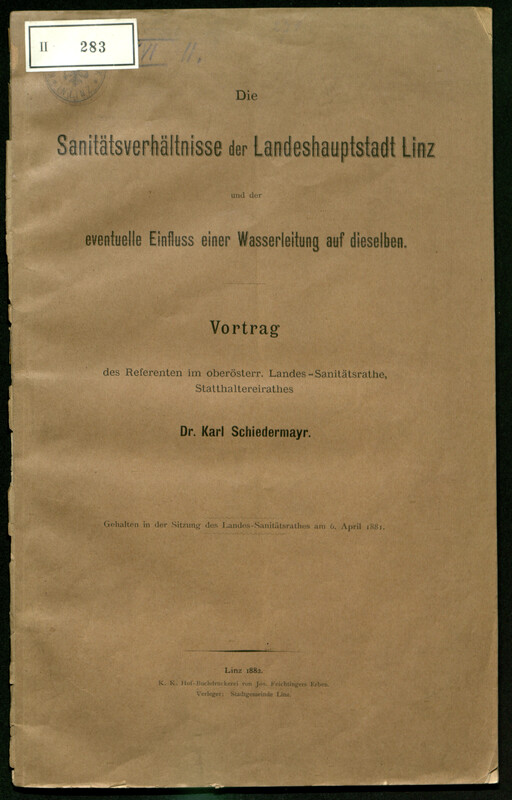 Around 1880, the physician Karl Schiedermayer investigated the sanitary conditions of Linz and the possible impact of a water pipeline, which he felt was needed. 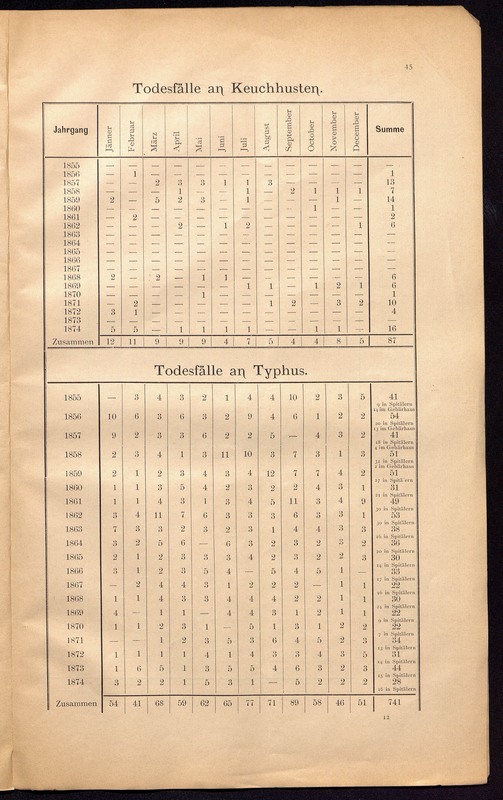 Schiedermayer’s study included an analysis of the causes of death, and therefore listed the numbers of cholera and typhoid fever casualties. 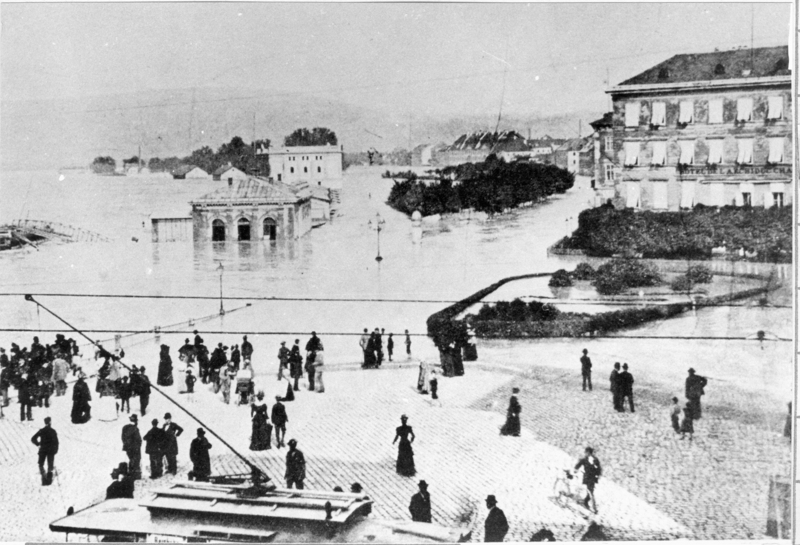 During a series of Danube floods in the late 1890s, the number of deaths from typhoid fever increased. Although a water pipeline had been introduced in 1893, most inhabitants were still dependent on water from house wells, some of which were contaminated during the floods. 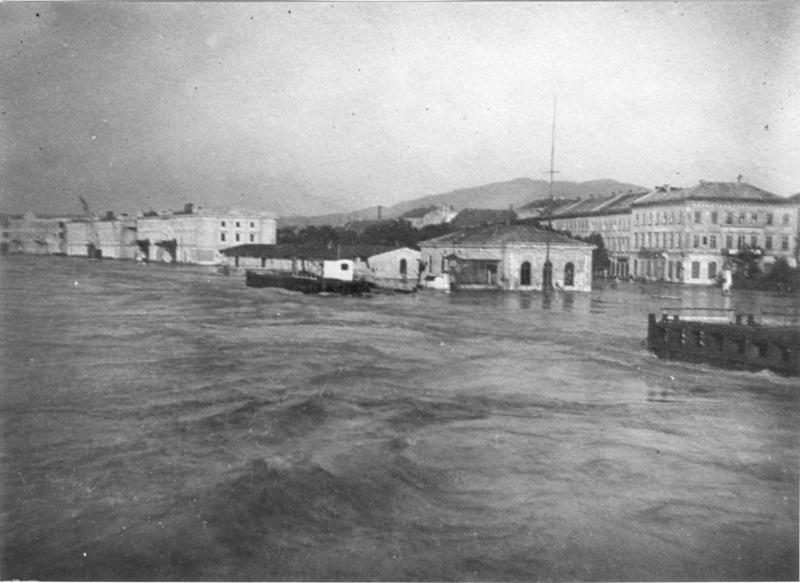 “Linz Hochwasser, Donaulände Lagerhäuser” (Signatur: Oberösterreichisches Landesarchiv, Allgemeine Fotosammlung, foto04779). As a consequence of a Danube flood in 1883, there were 26 casualties of typhoid fever. The provincial government (Statthalterei), the military command, and the association of physicians used the situation to demand that the city council find a solution for the water supply problem. The liberal majority of council members acknowledged the urgency of the introduction of a modern water supply system—even against the strong resistance of house owners, who feared financial burden. Still, it took another ten years, until 1893, before the municipal waterworks actually commenced operations. “Hochwasser, Donaulände Umschlagplatz” (Signatur: Oberösterreichisches Landesarchiv, Allgemeine Fotosammlung, foto04207). At the end of the century, the city council emphasized a connection between the general decrease in mortality and the city sanitation measures. This argumentation was certainly genuinely believed by the council, but it was also used to retroactively justify the expensive investment in the water infrastructure. This anecdote can only hint at the importance of the financial argument for the (delayed) introduction of the modern water infrastructure. Recent medical history has, of course, claimed that the causality of sanitary reform and the decrease in mortality is no longer sustainable since other factors such as improved nutrition and reduced virulence have contributed as well. In conclusion, the case study of Linz shows that neither the occurrence of cholera epidemics and increased typhoid fever cases, nor the perception of the diseases automatically led to sanitary reform. Thus, they cannot be interpreted as the trigger thereof. However, even though their epidemiological impact was relatively low (compared to other infectious diseases such as tuberculosis), cholera and typhoid fever, “the scandalized diseases,” did serve as steady reminders of sanitary grievances that needed remedy. Amongst other sanitary, financial, and administrative factors, the two diseases were therefore regularly reintroduced into the lengthy discussion of city sanitation in Linz. Pichler-Baumgartner, Luisa. “The Overrated Effect of Cholera and Typhoid Fever on Sanitary Reform: The Case of Linz.” Environment & Society Portal, Arcadia (Spring 2017), no. 6. Rachel Carson Center for Environment and Society. https://doi.org/10.5282/rcc/7746. Hardy, Anne I. Ärzte, Ingenieure und städtische Gesundheit: Medizinische Theorien in der Hygienebewegung des 19. Jahrhunderts. Kultur der Medizin, vol. 17. Frankfurt/M., New York: Campus, 2005. Vögele, Jörg. Sozialgeschichte städtischer Gesundheitsverhältnisse während der Urbanisierung. Schriften zur Wirtschafts- und Sozialgeschichte, vol. 69. Berlin: Duncker & Humblot, 2001. Weigl, Andreas. Demographischer Wandel und Modernisierung in Wien: Kommentare zum Historischen Atlas von Wien. Historischer Atlas von Wien, vol 1. Wien: Pichler, 2000. Witzler, Beate. Großstadt und Hygiene: Kommunale Gesundheitspolitik in der Epoche der Urbanisierung. Stuttgart: Franz Steiner, 1995. Disaster Ahead: How Danube Floods Created Telegraph Networks, Arcadia, 2012, no. 7. Luisa Pichler-Baumgartner is a recipient of a DOC Fellowship of the Austrian Academy of Sciences in the department of history, University of Salzburg. She studied history and English studies at the University of Salzburg and the IT Tallaght Dublin. In her dissertation project on environmental justice and water infrastructure in the city of Linz, she explores potential intersections of environmental and social history.